Is it truly a design flaw when one puts boiling liquid in front of a three-year-old? Since I was a small child, I have been enamored with the instant noodle. My mother would fry them up with eggs for breakfast from time to time and they were delicious to me. As time progressed, I decided to frequent Asian grocery stores and try different varieties. This led me to my current hobby: reviewing instant noodles from around the world. Thus far, I’ve reviewed just over 1,000 varieties from such far flung places as Japan, South Korea, Singapore, Poland, Great Britain, The Netherlands, Vietnam, China, Taiwan, and of course, the United States. Instant noodles are transmitted to us in many different ways. Commonly, we see them in a plastic package, accompanied by a packet. Those of us who are "on the go" require something that allows us to eat and run, and there we find the instant noodle cup. The cups are made of one of three materials: thin cardboard, plastic, or foam. The cup itself was designed by Momofuku Ando, the inventor of the instant noodle and founder of Nissin Foods back in 1971. During a flight, he decided he would like to see a portable way for people to enjoy his product. The design of the cup with its wide top and narrower bottom allows the dry noodles to hang suspended in the cup, allowing the water to reach throughout and cook the noodles evenly. Instant noodle cups are now made by many instant noodle companies worldwide with this design and abundantly available. In the last year or so, I have noticed many stories touting the dangers that instant noodle cups pose. Countless emergency room visits, poor design, easily tipped – these are generally the points that are brought up time and time again. Unfortunately, the true nature of the problem is often overlooked. Many people choose to add water to an instant noodle cup and put it in the microwave for a few minutes. If you look at the directions on the packaging, they more often than not recommend that you heat water in a separate container and then add it to the cup and let it steep. Most importantly, the claim that children are at risk of serious burns and injury. A recent lawsuit accuses an instant noodle company of being at fault for a child burning himself when a cup of noodles spilled over. He was three years old at the time of the incident in question. Would it be sensible to set a hot cup of coffee in front of a three year old? Probably not as the liquid inside is at a high temperature (which we all know after the famed McDonalds coffee spill lawsuit). The same goes with a freshly made cup of instant noodles. What’s different in this case, however, is that the user has added the liquid and heated it themselves. Handing a scalding hot cup of instant noodles to a child doesn’t sound like a good idea at all. The design flaw concept is another issue commonly mentioned; that the cup tips over far too easily. The term "design flaw" could easily be replaced by ‘user error.’ These cups don’t tip themselves over – they need some help by someone or something that is afforded the luxury of mobility. Have I tipped over a cup of hot instant noodles before? Yes. Was it my fault? Sure was. In any case, a little safety and common sense could save a lot of these emergency room visits. 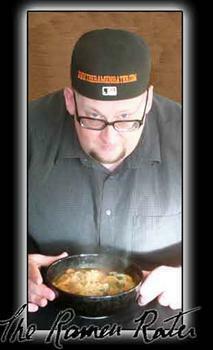 Hans Lienesch is the editor of The Ramen Rater.